East Coast Swing is a type of Rhythm Dance that has a long history and it is also one the best swing dances. You can see many other flavors of east coast swing dance and it has many names too, including: Jive, Jitterburg, Lindy Hop, Shag, Charleston. East Coast Swing is entertaining, fun, upbeat, non progressive and versatile dance distinguished by its “swing hip action” You will enjoy the energetic and refreshing feel of the East Coast Swing dance which carries you away as you dance across unlimited space. Characterized by its energetic twists and turns, a perfect dance for beginner dancers as well as advanced ballroom dance lovers, danced to Big Band Music. It is one of the most popular of all of the swing dances and tends to be the easiest one to learn. It is danced under fast swing music, including rock & roll and boogie- woogie and many current pop songs. East Coast SWwing was developed in 1940’s from the Lindy Hop. It was given this name (East Coast Swing) to distinguish it from a variant (The Jive) that was widely being danced in the competitive ballroom. East Coast Swing consists of 6 basic steps that can be danced in either single time or triple time. The American originated dance, the East Coast Swing really has a crispy history as it was first rejected by the American society of dance, but if we see its current status we will see that it is a major dance category in the mainstream social dance world. The dance experts of 30’s and 40’s considered it as just a fad that would not have any importance in the future and eventually die out. When anything is written in the book of future, it certainly happens. Same happened with the east coast swing when the dance pioneer Arthur Murray saw the real potential of this dance and took it to a next level. He sent his choreographers to different nightclubs to learn the steps of East Coast Swing, but every night club’s east coast swing dance varied town to town, and decided to standardize it with the help of a Hollywood choreographer and swing dance competitor Dean Collins. His version of the east coast swing consisted of 8 steps, which was later revised by Lauré Haile to a basic 6 step pattern. Within no time East Coast Swing started to reach everywhere and started featuring in various Hollywood movies such as Way out West, A Lady Takes a Chance, The Fighting Seabees and many more. The dance had captured the imagination of young people everywhere, It was widely danced in the U.S and Europe through the end of World War II. East Coast Swing dance is featured in many competitions, dance clubs, and studios around the globe. In the modern era of standardized American Style Ballroom Dance, there are essentially two basic swing dance styles. There is West Coast Swing and East Coast Swing. West Coast Swing ( which was developed in California) is danced by partners in a slot typically to slower and sultry music around 90 to 130 beats per minute. It is characterized by a distinctive elastic look that comes from its basic extension and compression technique of partner connection. It favors improvisation. East Coast Swing has incorporated the rest of the swing type dance rhythms including Jitterbug, Lindy, and Shag. East Coast Swing is danced in single, double, and triple time Swing rhythms. East Coast Swing is a standardized form of dance, developed first for instructional purposes, and then later codified to allow for a medium of comparison for competitive ballroom dancers. It can be said that there is no right or wrong way to dance it. However, certain styles of the dance are considered correct “form” within the technical elements documented and governed by the National Dance Council of America. The N.D.C.A. oversees all the standards of American Style Ballroom and Latin dances. 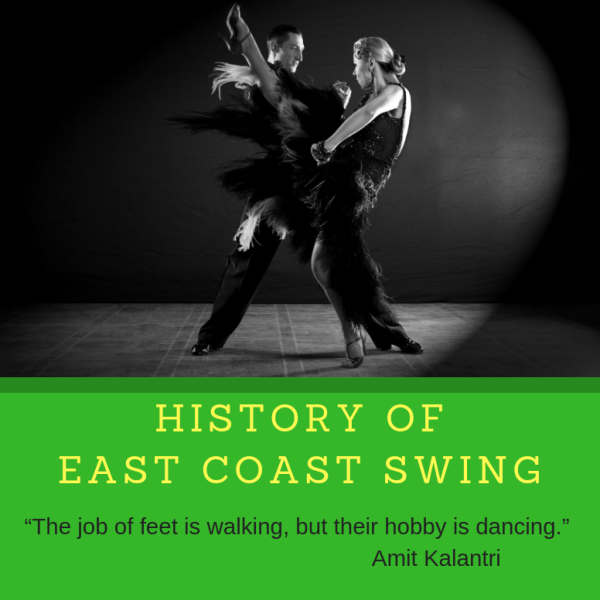 The East Coast Swing can be danced to about any speed of music. The International Style dance “Jive” is a variation of the triple time East Coast Swing and is danced in 136 to 144 beats per minute. 2. Bonnie and Clyde (Wanted Criminals in the era of the great depression) were first spotted dancing an amazing lindy when an individual dancer called the police. From that night they were always on a run. 3. People do not always pair off to dance on the east coast swing as you can also learn to swing dance alone or in a group. East Coast Swing really gives out vintage vibes to the viewers as it can be danced to many different song. You can listen to our Swing Music Playlist here. You can also learn this amazing dance style from many dance schools, and if you are interested in showing and learning some vintage moves you can contact Lake Shore Dance Academy and get yourself registered now. We are looking forward meeting you!